Almost exactly twenty years ago, in the midst of the so-called “Asian Contagion” financial crisis, Fed Chairman Alan Greenspan used the occasion of a 1998 Speech at the University of California at Berkeley to offer a perspective that was as prescient in 1998 as it is relevant in 2018. Mr. Greenspan was ultimately proven correct. 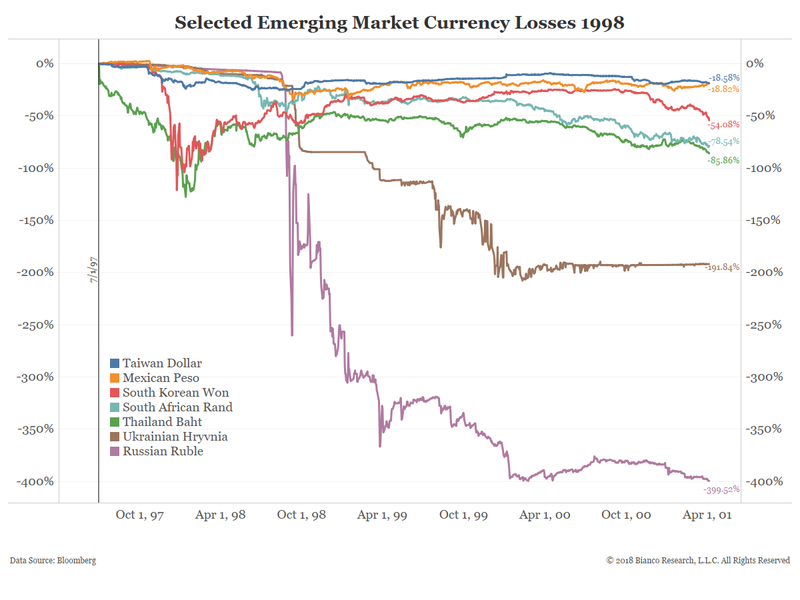 The initial crisis that started with the competitive devaluation of the Thai baht (Thailand’s currency) caused a 5% decline in domestic stocks on October 27, 1997. 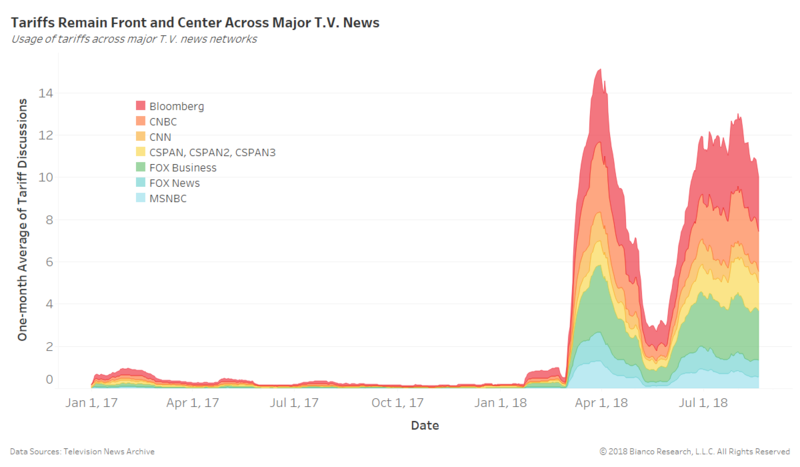 Almost exactly a year later, the crisis spread across the globe, including a Russian default on its sovereign debt, a 20% decline in the S&P 500, and the Federal Reserve’s emergency bail-out of the massive Long-Term Capital Management hedge fund, which was viewed as systemically critical as it was using extreme leverage to control 5% of the entire global bond market. As recently as 2015, concerns about a Chinese recession and a surprise 2% devaluation of their currency catalyzed a greater than 10% decline in domestic stocks. Our point is not that history is necessarily repeating itself, as there are significant differences between then and now, particularly in regard to both the operation of the currency markets and the scope of the events. At the same time, there are enough similarities where we believe that it is becoming increasingly important to be mindful of Chairman Greenspan’s 1998 speech, and the important lesson that it teaches: that this is a global financial community, which means that virtually no economy or financial market is, over the longer term, an island. Indeed, over the intermediate and longer term, economic convergence is not just a risk. It is a virtual inevitability, which is why it has historically made sense to come to the economic aid of your major trading partners and political allies rather than to make their situation worse (particularly at a time when monetary accommodation, which has served as a shock absorber for the markets and global economy since late 2008, is being slowly withdrawn). Nationalistic narcissism is the definitive example of “cutting off your nose to spite your face”, and an important consideration for investors, in light of the fact that external shocks are one of the three most common bear market catalysts. The other two are the onset of recessions and periods of overly aggressive tightening on the part of the Federal Reserve. That’s not to suggest however that an economy or market can’t be an island over the shorter term. That is what allows for tactical investment opportunities and relative outperformance. 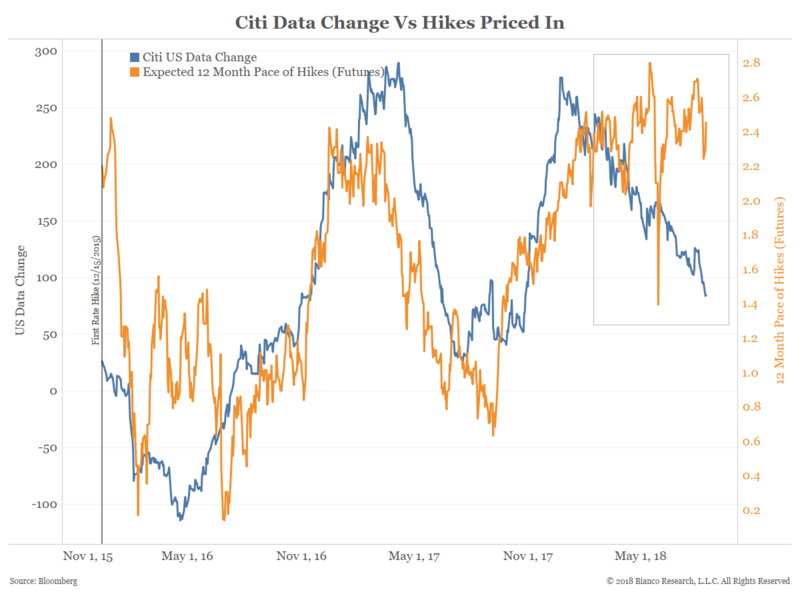 We are seeing that now in a comparison of the Citigroup economic data indexes, which illustrate how current economic data compares to the same data from one year earlier (readings above the zero-line illustrate positive economic growth). Through this chart, you can clearly see that only the U.S. and Latin America are enjoying positive trends in economic growth, and that the relative rate of economic improvement is already slowing in the U.S. 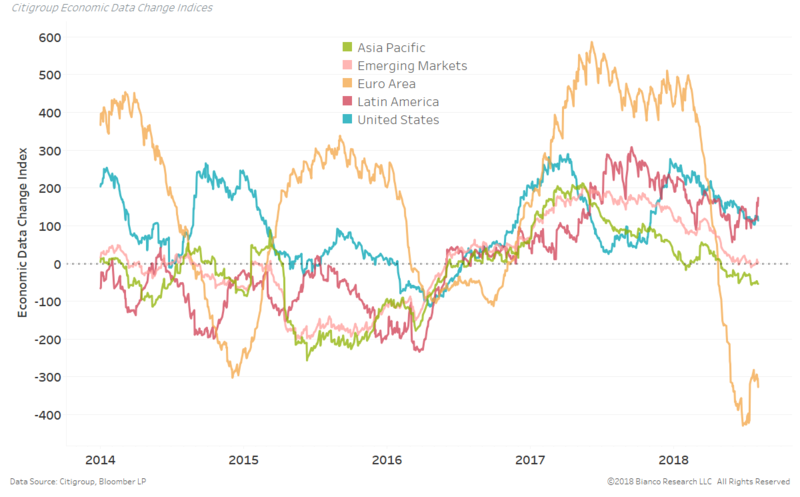 The Asia/Pacific region and emerging markets in general are showing signs of slipping into recession, and Europe is showing some hopeful signs of recovery after falling off of an economic cliff over recent months. 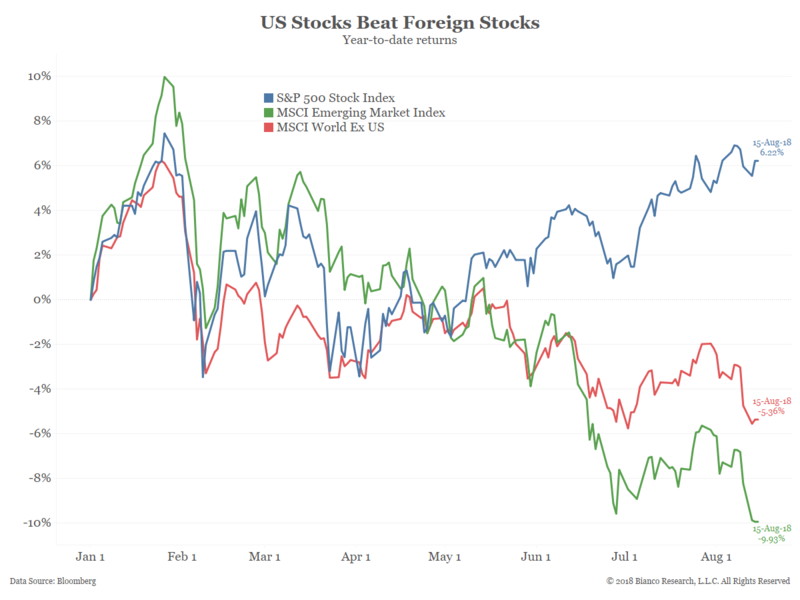 You can also see America’s unique status reflected in the relative performance of the domestic stock markets versus those of America’s global counterparts. This has been a great boon for the performance of U.S.-centric portfolios and the bane of globally diversified portfolios. 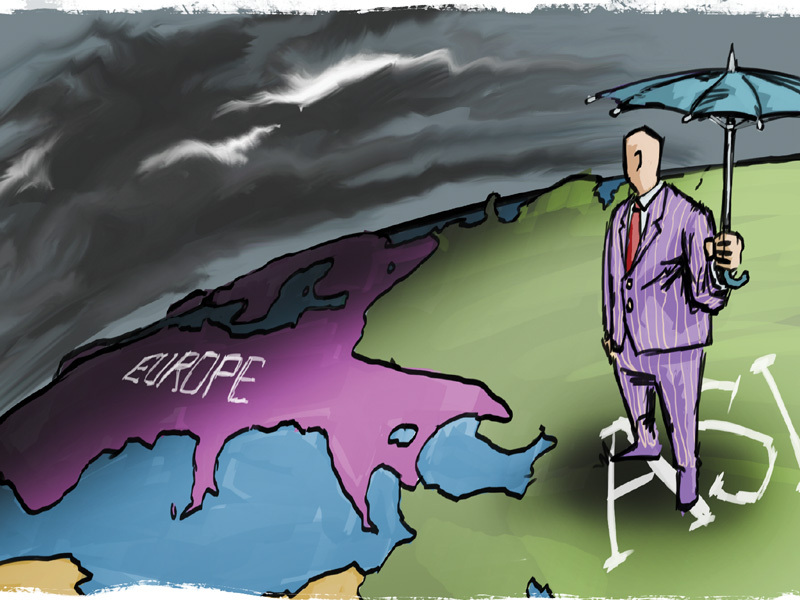 However, the lesson of history is that the economic fate of the majority of world economies will ultimately converge. 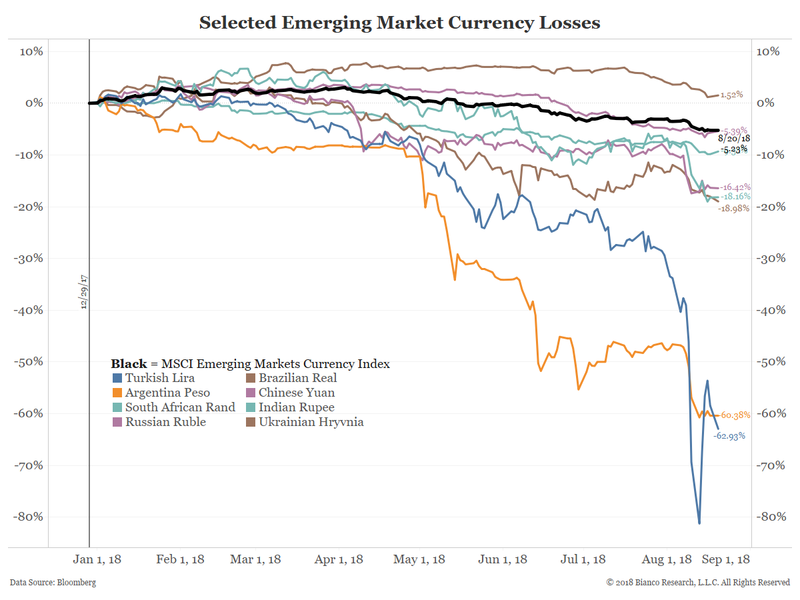 Whether that happens as the result of the U.S. underperforming on the downside or the rest of the world out-performing on the upside remains to be seen, but we believe that such a “reversion to the mean” is ultimately highly likely, and that the most opportunistic place to invest money over the intermediate term is probably outside of America’s borders. While we suspect that this will ultimately prove to be true, the markets will likely need a catalyst for such a significant sea-change. This might include news of either a successful transition away from monetary stimulus in Europe and/or Japan, the successful conclusion of a trade deal with the European Union, or a significant worsening of President Trump’s political/legal standing (a growing likelihood). 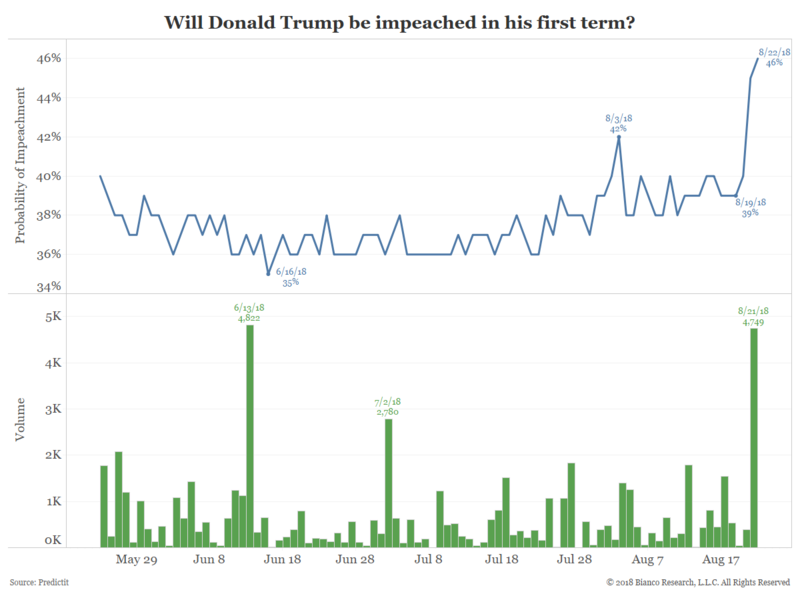 It could also be because of the strong rally in the dollar finally running out of steam, which we believe was introduced as a viable possibility during Federal Reserve Chairman Powell’s August 24th speech at Jackson Hole. A weaker dollar should be particularly bullish for emerging market stocks and bonds, and would benefit domestic multi-national stocks over smaller, domestically-oriented ones. However, just because the United States looks much better from an economic and market perspective than does its international peers, that is not to suggest that the combination of higher domestic interest rates, a capacity-constrained economy, the onset of quantitative tightening in the U.S., and the risks of a full-blown trade war are not having a material impact. 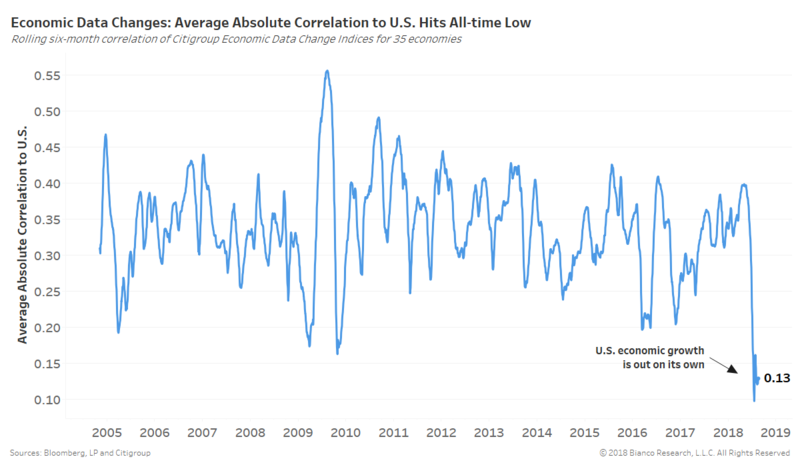 Indeed, while the U.S. economy overall continues to grow at an extraordinary pace as a result of tax reform, deregulation, low interest rates, fiscal stimulus and monetary accommodation, the rate of improvement in economic data is clearly moderating. If there is any good news on the trade front, it is that the economy of China, which is the only country against whom America’s aggressive trade policies are, in our opinion, actually warranted, appears to be feeling the impact of the trade conflict on many levels, including their economy, their currency, and their equity markets. 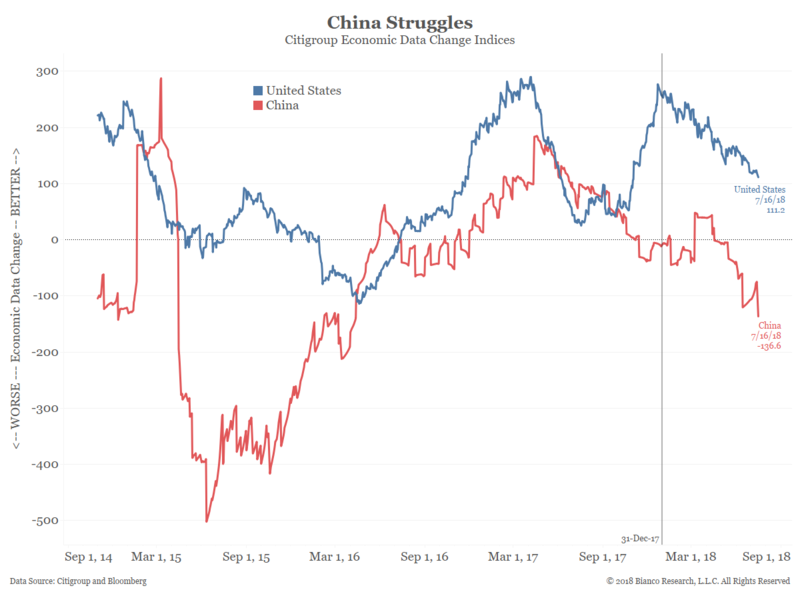 As evidence, the Citigroup Economic Data Change Index for China is now below the zero line, which means that their economic data is starting to indicate contraction on a year-over-year basis. While we maintain our stance that nothing will be resolved with China until after the mid-term elections at the earliest, China’s increasing difficulties may create an environment in which China may actually be willing to make some reasonable trade-related concessions. In the meantime, it does appear that progress is being made in trade negotiations between the U.S. and Mexico, which should, in turn, help to expedite the return of Canada to the negotiating table and ultimately a reworking of the NAFTA Agreement. This would provide a much-needed win for the Trump White House, and offer significant relief for American businesses, as it should greatly reduce the risk of supply-chain-related disruptions. The other two traditional threats to a bull market (a recession and/or overly-restrictive monetary policy) are essentially two-sides of the same coin, as most recessions have been caused by the Federal Reserve raising rates either too high or too fast. In their defense, monetary policy changes, such as changes in interest rates and money supply, have historically taken twelve to eighteen months to fully impact the economy, so the Federal Reserve has no way of knowing that they have taken monetary policy too far in one direction or the other until it is essentially too late. In his Jackson Hole speech, Chairman Powell raised the intriguing possibility that he might again expand the Fed’s mandates from the traditional two of maximum employment and low sustainable inflation, and reintroduce an objective of “financial stability”, which it initially introduced as a Federal Reserve mandate during the 2007-2008 Global Financial Crisis. 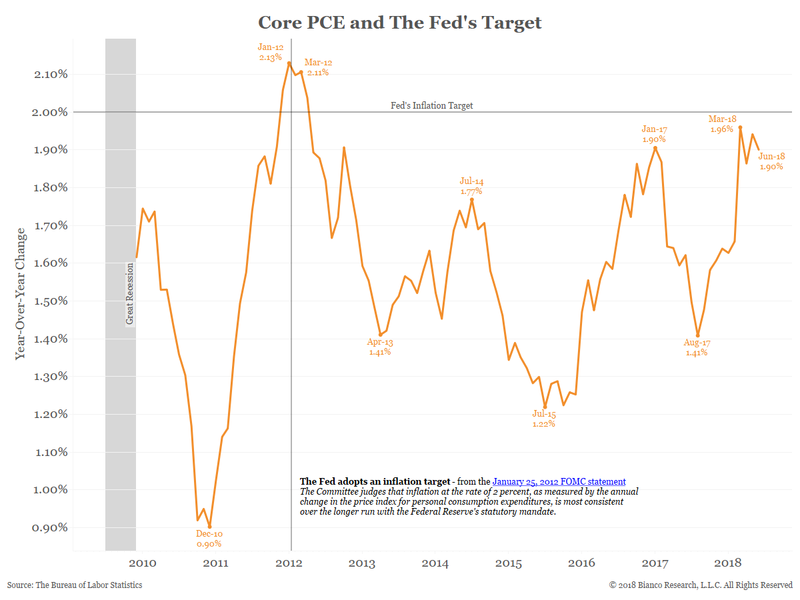 As Powell correctly noted in his speech, “Whatever the cause, in the run-up to the past two recessions, destabilizing excesses appeared mainly in financial markets rather than in inflation… Thus, risk management suggests looking beyond inflation for signs of excesses”. Powell went on to state that the Fed would “do whatever it takes” to avoid another financial crisis. In other words, the Fed seems less concerned about a return of retail inflation, and more committed to be diligent in guarding against financial speculation and excessive leverage in both the real economy and the financial markets. One of the more intriguing questions introduced into the markets through Powell’s comment is whether or not such a change in Fed perspective might increase investor interest in “value” and defensive sectors like healthcare, consumer staples, utilities, etc. 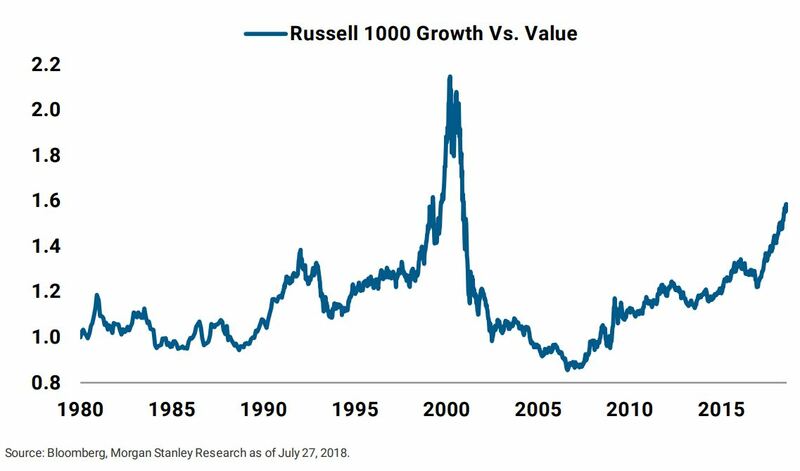 This too would be quite a sea-change, as growth stocks have been out-pacing value stocks over recent years by the largest amount since the 1999 technology bubble. 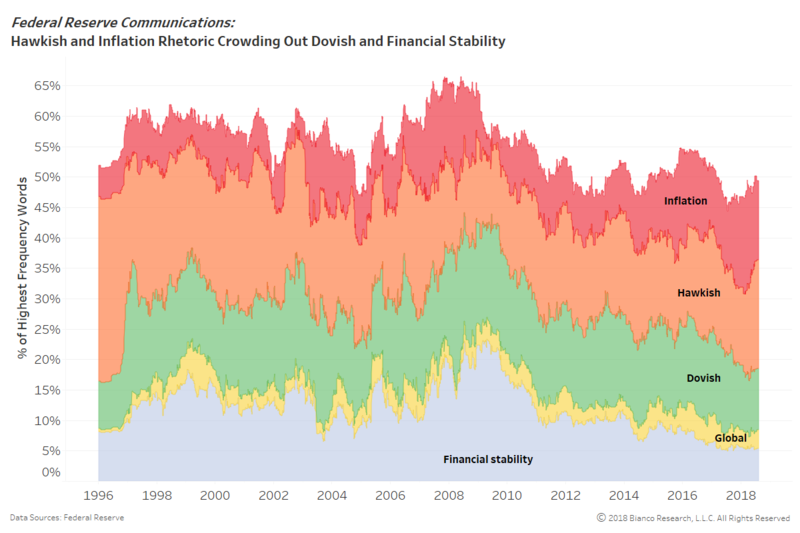 As noted, we thus view this as a potentially important change, as the percentage of Fed commentary spent addressing financial stability has been declining consistently for almost a decade. 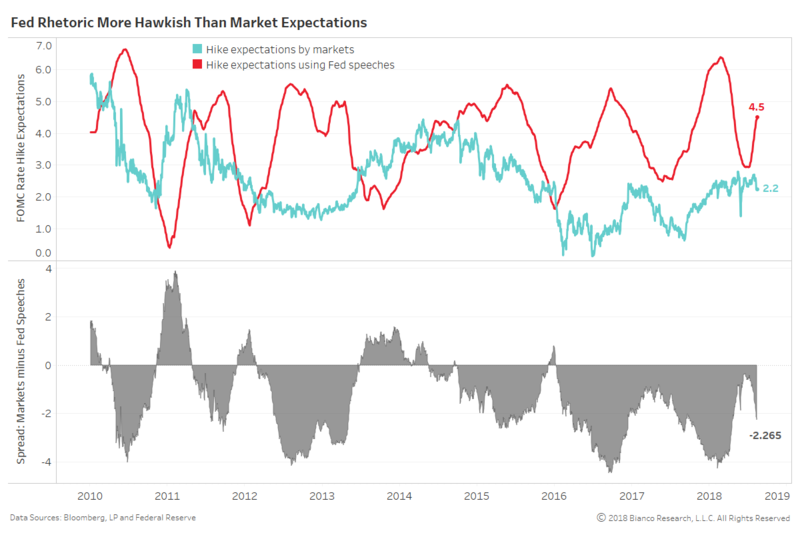 Instead, Fed commentary has recently concentrated on inflationary risks and hawkish concerns about the potential for the economy to run too hot. The Federal Reserve, and much of the analytical community, have looked at the extraordinary levels of monetary liquidity, the years of near-zero interest rates and the recent injection of fiscal stimulus into an economy that was already capacity-constrained and rationally assumed that a return of undesirably high inflation was just a matter of time, as is suggested by classic economic theory. However, inflation still remains below the Fed’s desired target, 10-year bond yields have thus far shown an inability to stay above 3%, consumer expectations for future inflation remain remarkably low, and the financial markets themselves are looking for the Fed to raise rates only half as much as the Fed is suggesting that it will through its guidance. If anything, it looks like the deflationary influences coming from the world outside of our borders (and on-line retailing) are presently still sufficient to keep prices at bay, and that the Fed seems to be the only party overtly concerned about excessive inflation. If the markets prove to be correct and the Federal Reserve comes around to their way of thinking, that suggests slower and more limited interest rate hikes, which would be good for most stocks and bonds in the U.S. Of note, the stocks of smaller companies tend to benefit disproportionately from lower interest rates, as their debt tends to be adjustable-rate, whereas their larger brethren tend to have fixed-rate debt. Another primary beneficiary might be U.S. Treasuries, which are currently the most heavily shorted in their history (which may cause forced buying of Treasuries if prices start to move higher). The notable exceptions to this bullish expectation would likely be bank stocks and adjustable-rate and/or inflation-indexed debt. On the other hand, if the Fed’s recent inflation concerns prove justified, it will mean that neither the stock nor bond markets will have properly priced in the outlook for higher rates, and this would be a negative for most U.S. stocks and bonds (with the notable exceptions again likely being bank stocks and adjustable-rate and/or inflation-indexed debt). Under the third and historically most common scenario, the Federal Reserve will ignore the signals coming from the market and continue tightening monetary policy until, as the old saying goes, “something breaks”, and the economy sinks into recession. However, it is encouraging that Chairman Powell seems acutely aware of both this risk and the Fed’s history of overshooting when making changes in monetary policy. Even so, the message of the futures markets is that there is at least a growing risk that the Fed is going to overreact and ultimately create a recession. 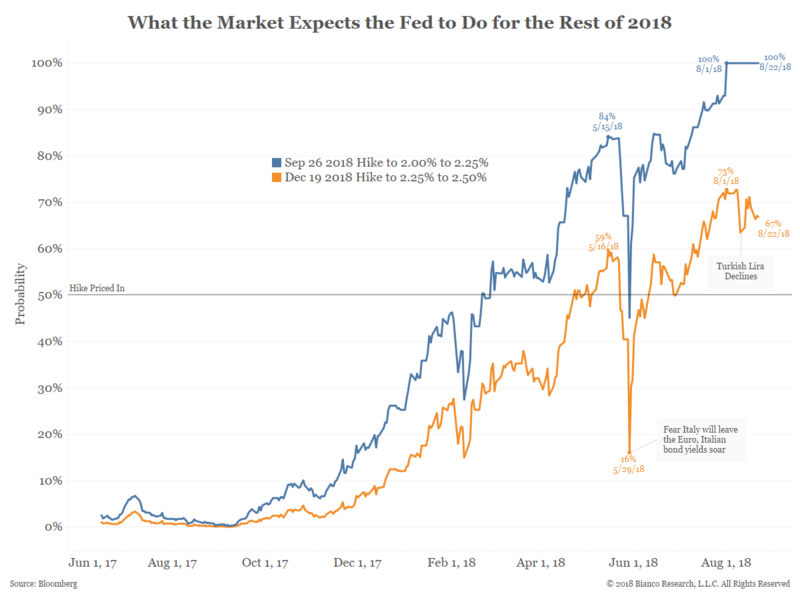 You can see this reflected in the recent divergence between the trend in economic data (blue line, bottom chart) and the number of Fed interest rate hikes being priced in by the markets (orange line). 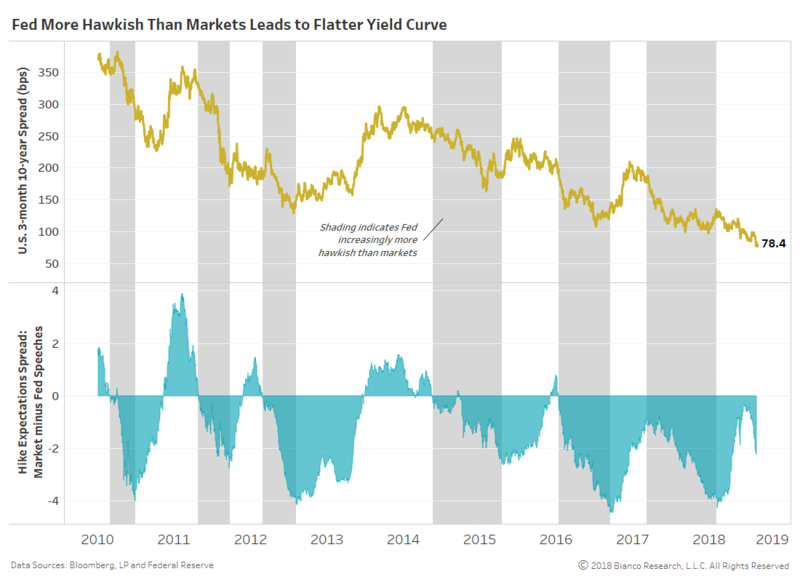 The Fed’s ability to effectively navigate through its withdrawal of monetary stimulus is, in this instance, also uniquely compromised by what we call the “yield curve dilemma”. To explain, in pursuit of future monetary policy flexibility, the Fed feels compelled to continue raising short-term rates. At the same time, for the aforementioned reasons, long-term rates refuse to move higher. This can be problematic as, when short-term rates move higher than long-term rates, it makes it unprofitable for banks to lend, and thus normally dries up liquidity and causes a recession. 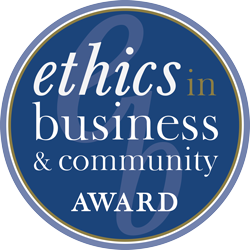 Meanwhile, we recommend ignoring the political drama, remaining diligent, and remaining invested. Trade policy and the Fed still “trump” all, and everything else is just a distraction.